We review experiments on mid-infrared supercontinuum (SC) generation including our own work on chalcogenide waveguides. Simulations are used to define the conditions in which a chalcogenide waveguide would produce SC from ≈2.5 µm to beyond 10 µm in a single waveguide device. The simulations suggested that broadband SC could be generated by pumping a bulk chalcogenide with fs pulses in the anomalous dispersion regime and this was demonstrated experimentally by producing a flat SC from 2.5 µm to beyond 7.5 µm. H. Kano and H. O. Hamaguchi, “Vibrationally resonant imaging of a single living cell by supercontinuum-based multiplex coherent anti-Stokes Raman scattering microspectroscopy,” Opt. Express 13(4), 1322–1327 (2005). A. Schliesser, N. Picque, and T. W. Hansch, “Mid-infrared frequency combs,” Nat. 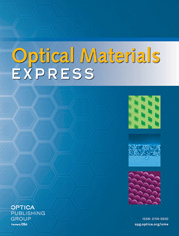 Photonics 6(7), 440–449 (2012). J. H. Kim, M. K. Chen, C. E. Yang, J. Lee, S. Yin, K. Reichard, P. Ruffin, E. Edwards, C. Brantley, and C. Luo, “Middle-IR supercontinuum generations and applications,” Proc. SPIE 7056, 70560V, 70560V-9 (2008). C. S. Colley, J. C. Hebden, D. T. Delpy, A. D. Cambrey, R. A. Brown, E. A. Zibik, W. H. Ng, L. R. Wilson, and J. W. Cockburn, “Mid-infrared optical coherence tomography,” Rev. Sci. Instrum. 78(12), 123108 (2007). S. Dupont, C. Petersen, J. Thøgersen, C. Agger, O. Bang, and S. R. Keiding, “IR Microscopy utilizing intense supercontinuum light source,” Opt. Express 20(5), 4887–4892 (2012). B. Kuyken, X. Liu, R. M. Osgood, R. Baets, G. Roelkens, and W. M. J. Green, “Mid-infrared to telecom-band supercontinuum generation in highly nonlinear silicon-on-insulator wire waveguides,” Opt. Express 19(21), 20172–20181 (2011). W. Q. Zhang, H. Ebendorff-Heidepriem, T. M. Monro, and S.V. Afshar, “Fabrication and supercontinuum generation in dispersion flattened bismuth microstructured optical fiber,” Opt. Express 19(22), 21135–21144 (2011). R. Buczynski, H. Bookey, R. Stepien, J. Pniewski, D. Pysz, A. J. Waddie, A. K. Kar, and M. R. Taghizadeh, “Toward Mid-IR supercontinuum generation in bismuth-lead-galate glass based photonic crystal fibers,” Proc. SPIE 8434, 84340Z1–84340Z-7 (2012). J. H. Kim, M.-K. Chen, C. E. Yang, J. Lee, S. S. Yin, P. Ruffin, E. Edwards, C. Brantley, and C. Luo, “Broadband IR supercontinuum generation using single crystal sapphire fibers,” Opt. Express 16(6), 4085–4093 (2008). C. R. Phillips, C. Langrock, J. S. Pelc, M. M. Fejer, J. Jiang, M. E. Fermann, and I. Hartl, “Supercontinuum generation in quasi-phase-matched LiNbO3 waveguide pumped by a Tm-doped fiber laser system,” Opt. Lett. 36(19), 3912–3914 (2011). A. S. Kurkov, V. A. Kamynin, V. B. Tsvetkov, Y. E. Sadovnikova, A. V. Marakulin, and L. A. Minashina, “Supercontinuum generation in thulium-doped fibres,” Quantum Electron. 42(9), 778–780 (2012). W. Q. Yang, B. Zhang, J. Hou, R. Xiao, Z. F. Jiang, and Z. J. Liu, “Mid-IR supercontinuum generation in Tm/Ho codoped fiber amplifier,” Laser Phys. Lett. 10(5), 055107 (2013). J. Geng, Q. Wang, and S. Jiang, “High-spectral-flatness mid-infrared supercontinuum generated from a Tm-doped fiber amplifier,” Appl. Opt. 51(7), 834–840 (2012). L. B. Shaw, B. Cole, J. S. Sanghera, I. D. Aggarwal, F. H. Kung, S. S. Bayya, R. Mossadegh, P. A. Thielen, J. R. Kircher, and R. L. Murrer., “Development of IR-emitting infrared fibers at the naval research laboratory,” SPIE 4366, 90–95 (2001). X. Feng, W. H. Loh, J. C. Flanagan, A. Camerlingo, S. Dasgupta, P. Petropoulos, P. Horak, K. E. Frampton, N. M. White, J. H. V. Price, H. N. Rutt, and D. J. Richardson, “Single-mode tellurite glass holey fiber with extremely large mode area for infrared nonlinear applications,” Opt. Express 16(18), 13651–13656 (2008). P. Domachuk, N. A. Wolchover, M. Cronin-Golomb, A. Wang, A. K. George, C. M. B. Cordeiro, J. C. Knight, and F. G. Omenetto, “Over 4000 nm bandwidth of mid-IR supercontinuum generation in sub-centimeter segments of highly nonlinear tellurite PCFs,” Opt. Express 16(10), 7161–7168 (2008). D. Buccoliero, H. Steffensen, O. Bang, H. Ebendorff-Heidepriem, and T. M. Monro, “Thulium pumped high power supercontinuum in loss-determined optimum lengths of tellurite photonic crystal fiber,” Appl. Phys. Lett. 97(6), 061106 (2010). G. Qin, X. Yan, M. Liao, A. Mori, T. Suzuki, and Y. Ohishi, “Wideband supercontinuum generation in tapered tellurite microstructured fibers,” Laser Phys. 21(6), 1115–1121 (2011). I. Savelii, O. Mouawad, J. Fatome, B. Kibler, F. Désévédavy, G. Gadret, J.-C. Jules, P.-Y. Bony, H. Kawashima, W. Gao, T. Kohoutek, T. Suzuki, Y. Ohishi, and F. Smektala, “Mid-infrared 2000-nm bandwidth supercontinuum generation in suspended-core microstructured Sulfide and Tellurite optical fibers,” Opt. Express 20(24), 27083–27093 (2012). M. Liao, W. Gao, T. Cheng, Z. Duan, X. Xue, H. Kawashima, T. Suzuki, and Y. Ohishi, “Ultrabroad supercontinuum generation through filamentation in tellurite glass,” Laser Phys. Lett. 10(3), 036002 (2013). G. Qin, X. Yan, C. Kito, M. Liao, C. Chaudhari, T. Suzuki, and Y. Ohishi, “Ultrabroadband supercontinuum generation from ultraviolet to 6.28μm in a fluoride fiber,” Appl. Phys. Lett. 95(16), 161103 (2009). O. P. Kulkarni, V. V. Alexander, M. Kumar, M. J. Freeman, M. N. Islam, F. L. Terry, M. Neelakandan, and A. Chan, “Supercontinuum generation from ~1.9 to 4.5µm in ZBLAN fiber with high average power generation beyond 3.8µm using a thulium-doped fiber amplifier,” J. Opt. Soc. Am. B 28(10), 2486–2498 (2011). M. Eckerle, C. Kieleck, J. Świderski, S. D. Jackson, G. Mazé, and M. Eichhorn, “Actively Q-switched and mode-locked Tm3+-doped silicate 2 μm fiber laser for supercontinuum generation in fluoride fiber,” Opt. Lett. 37(4), 512–514 (2012). C. Agger, C. Petersen, S. Dupont, H. Steffensen, J. K. Lyngsø, C. L. Thomsen, J. Thøgersen, S. R. Keiding, and O. Bang, “Supercontinuum generation in ZBLAN fibers - detailed comparison between measurement and simulation,” J. Opt. Soc. Am. B 29(4), 635–645 (2012). M. Liao, W. Gao, T. Cheng, X. Xue, Z. Duan, D. Deng, H. Kawashima, T. Suzuki, and Y. Ohishi, “Five-Octave-Spanning Supercontinuum Generation in Fluoride Glass,” Appl. Phys. Express 6(3), 032503 (2013). C. L. Thomsen, F. D. Nielsen, J. Johansen, C. Pedersen, P. M. Moselund, U. Møller, S. T. Sørensen, C. Larsen, and O. Bang, “New horizons for supercontinuum light sources: from UV to mid-IR,” Proc. SPIE 8637, 86370T, 86370T-6 (2013). A. Marandi, C. W. Rudy, V. G. Plotnichenko, E. M. Dianov, K. L. Vodopyanov, and R. L. Byer, “Mid-infrared supercontinuum generation in tapered chalcogenide fiber for producing octave-spanning frequency comb around 3 μm,” Opt. Express 20(22), 24218–24225 (2012). L. B. Shaw, R. R. Gattass, J. Sanghera, and I. Aggarwal, “All-Fiber Mid-IR Supercontinuum Source from 1.5 to 5µm,” Proc. SPIE 7914, 79140P, 79140P-5 (2011). X. Gai, D.-Y. Choi, S. Madden, Z. Yang, R. Wang, and B. Luther-Davies, “Supercontinuum generation in the mid-infrared from a dispersion-engineered As2S3 glass rib waveguide,” Opt. Lett. 37(18), 3870–3872 (2012). F. Silva, D. R. Austin, A. Thai, M. Baudisch, M. Hemmer, D. Faccio, A. Couairon, and J. Biegert, “Multi-octave supercontinuum generation from mid-infrared filamentation in a bulk crystal,” Nat Commun. 3, 807 (2012). M. J. Weber, Handbook of optical materials. (CRC Press, Boca Raton, 2003). D. A. P. Bulla, R. P. Wang, A. Prasad, A. V. Rode, S. J. Madden, and B. Luther-Davies, “On the properties and stability of thermally evaporated Ge-As-Se thin films,” Appl. Phys., A Mater. Sci. Process. 96(3), 615–625 (2009). A. Prasad, C. J. Zha, R. P. Wang, A. Smith, S. Madden, and B. Luther-Davies, “Properties of GexAsySe1-x-y glasses for all-optical signal processing,” Opt. Express 16(4), 2804–2815 (2008). V. Z. Kolev, M. W. Duering, B. Luther-Davies, and A. V. Rode, “Compact high-power optical source for resonant infrared pulsed laser ablation and deposition of polymer materials,” Opt. Express 14(25), 12302–12309 (2006). R. J. Weiblen, A. Docherty, J. Hu, and C. R. Menyuk, “Calculation of the expected bandwidth for a mid-infrared supercontinuum source based on As2S3 chalcogenide photonic crystal fibers,” Opt. Express 18(25), 26666–26674 (2010). J. Hu, C. R. Menyuk, L. B. Shaw, J. S. Sanghera, and I. D. Aggarwal, “Maximizing the bandwidth of supercontinuum generation in As2Se3 chalcogenide fibers,” Opt. Express 18(7), 6722–6739 (2010). Fig. 1 Experimental results of SC generation from an As2S3 glass rib waveguide 2.5 µm thick on a MgF2 substrate and Teflon coating and pumped at 3.8 µm (red); 3.65 µm (blue) and 3.26 µm (green) at a peak power of ≈1000 W.
Fig. 2 A schematic of the structure of the all-chalcogenide rib waveguide. Fig. 3 The (a) dispersion parameter D and (b) nonlinear parameter γ for the fundamental TM mode as a function of wavelength and core film thickness for a rib waveguide with 40% etched depth. The locus of the zero dispersion and the contour for γ = 0.5 W−1m−1 are shown by the white lines. Fig. 4 Simulated SC spectra for different wavelengths and increasing values of γPL for 7.5 ps pulses. Blue 2 µm; green 3 µm; red 4 µm; turquoise 5 µm. (a) γPL = 49; (b) γPL = 77; (c) γPL = 91; (d) γPL = 105. Fig. 5 Simulated SC spectra for different wavelengths and increasing values of γPL for 250 fs pulses. Blue 2 µm; green 3 µm; red 4 µm; turquoise 5 µm. (a) γPL = 7; (b) γPL = 21; (c) γPL = 49; (d) γPL = 77. Fig. 6 The time dependence of the power at the waveguide output from simulations. (a) 250 fs pulses for γPL = 7 at 5 µm demonstrating soliton pulse compression. (b) 7.5 ps pulses for γPL = 64 at 5 µm demonstrating break-up of the pulse envelope into multiple solitons. Fig. 7 (a). Spectra recorded at ≈20 MW (red), ≈6 MW (blue) and ≈3 MW (green) peak power. The detector response is shown as a black dotted line. 7(b) the spectrum at ≈20 MW has been corrected for the spectral response of the detector. 7(c) comparison of spectra at ≈20 MW produced using 5.3 µm and 3.425 µm pumps.